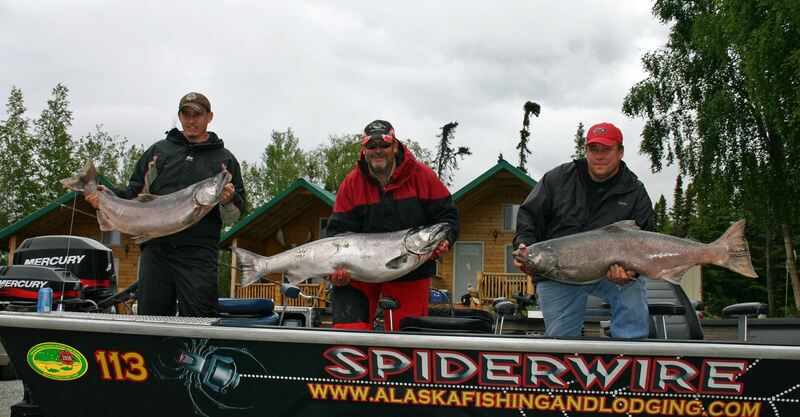 Alaska Fishing and Lodging has been putting together quality Alaska salmon fishing trips and fishing vacation packages for years. We pride ourselves in customer care and attention to detail and we go the extra mile to make sure your Alaska fishing vacation and adventure turns out to be the best it can be. Experience Alaska Salmon Fishing at it’s best with Owner and Guide, Tyland Van Lier. We are now booking fully guided Alaska salmon fishing trips on the Kenai River. I could easily give you 100 reasons to come to Alaska this year to experience some of the best salmon fishing available anywhere on earth. But in an effort to keep this brief, I’ll keep it to just the top 10 reasons that are more than reason enough. Salmon fishing in Alaska is unlike any found in any other state in the country. 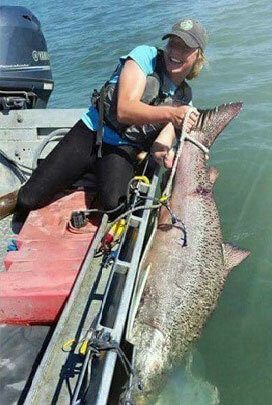 While other states have some great fishing, Alaska still boasts as having the best salmon fishing year after year. So, if you find yourself in pursuit of Alaska’s behemoth salmon that return to the fish rich waters of the Kenai River each year, this just may be the best year to step up and realize this dream. Amazing as it seems, there are fewer anglers making their way to Alaska today then there was just a few years ago. The Kenai River is an amazing place to fish. The numbers of salmon and rainbow trout that this river supports is mind boggling and it is world famous for big king salmon. 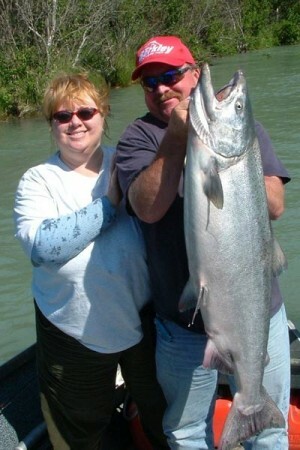 In fact, the world record king salmon was caught near our lodge in the Kenai and weighed in at 97 lbs 4oz. Alaska Air has some super low fares if you book your flights soon. Our partners still have affordable rental cars available on most dates. Local tour companies have openings to extend your vacation. The long term forecast is for a warm and sunny summer. May through July is typically pretty darn nice anyway so come on up and wet a line. Alaska salmon fishing is going to be fantastic. King Salmon are the largest anachronous fish in Alaska and only on the Kenai River do King Salmon get to 100 pounds and possibility more. Why this is so is anyone guess. What we do know is that we hook some massive fish that just tax the gear to it’s limit and beyond. Salmon Fishing is great in Alaska so lets go fishing! Prices have not been this low in over 10 years. Call 1-907-262-1521 to plan your trip today. Oops, that’s eleven! So tell us what your thinking. What do we need to do to get you in our boats this summer? See Catch & Release for more information of how we are working to preserve the trophy fishing on the mightiest of all rivers, The Kenai. Book your Alaska Salmon Fishing trips today with Tyland Van Lier of Alaska Fishing and Lodging and enjoy first class, fully guided Alaska salmon fishing trips that are assured to make those memories last for a lifetime. Fish On… That’s the cry that makes your heart skip a beat and it’s also responsible for the boat loads of adrenaline that keeps you coming back year after year. Practice yelling this at home, FISH ON… and a few extra expletives like Holly Cow! Exactly what a wholly cow is I’m not sure but you sure here it load and clear all along the river a lot these days. Call today and lets talk Alaska salmon fishing!